Welcome to week 3 of going through dog breeds, covering some basic titbits about the breeds. This will be in between other posts too. This, the third, post will cover G-I of dog breeds. In previous posts, A-C and D-F have been covered. Original Use: Gundog, used mainly for hunting birds – the use also known as Hunt, Point and Retrieve (HPR). The Short Haired being developed in the late 1800’s, and the Wire Haired being developed in the early 1900’s. The name being mainly due to the “pointing” to where prey is (pictured by the Wire Haired Pointer below). Outstanding Physical Trait: The difference in the fur types of both dog types is very easily distinguishable; the short, smooth fur of the Short Haired, and the longer, wire-type hair of the Wire Haired (hence the names). Both dogs look quite different just due to the different coat types! Country of Origin: Germany. However, it is also said to have been bred and named after the Alsace region, Germany/ France – this region has switched hands between Germany and France a few times. Original Use: Herding (or shepherding – name origin). However this breed has been used as a military dog since WW2, and more recently within the police force too. They are also used as guide dogs, although not as commonly used for this role as the Labrador Retriever. This breed has also been used as a guard dog (for herds, homes, etc.) and still fulfils this role today. Outstanding Physical Trait: It bares a wolf-like appearance, but with a different colouration. Unfortunately, due to Kennel Club breed standards, specifying the angle the legs/hips ‘need’ to be in relation to the body, causing a sloping back and weak hind legs; the hind legs and spine can suffer health-wise, and often the hind legs cannot support the animal. Outstanding Physical Trait: The sheer size is usually the first thing people notice about the Great Dane! 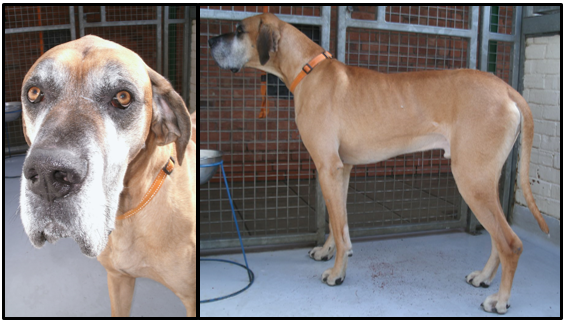 However, there are plenty of breeds bigger (classified as ‘giant’ breeds rather than just ‘large’) but most people still think “large size” when thinking of the Great Dane. They have long, slender legs, and slender bodies – with quite long tails. They are a beautiful breed with naturally floppy ears (which is how these dogs ought to look) – the ear cropping (which has thankfully been banned in the UK along with tail docking, since 2007) is often done to this breed to make them look fiercer for the purpose of guarding. Original Use: Scent hound – bred for hunting in the 13th Century, bred as a smaller version of the Fox Terrier. Used in a pack, alongside people on horseback, to track and hunt small animals – much in the same way Fox Terriers and Beagles were used (up until recently), however the Harrier is taller than the Beagle. Outstanding Physical Trait: The Harrier doesn’t have anything specifically outstanding about it physically, it looks like a big Beagle or a small Fox Terrier – similar in markings, colouration , and appearance. 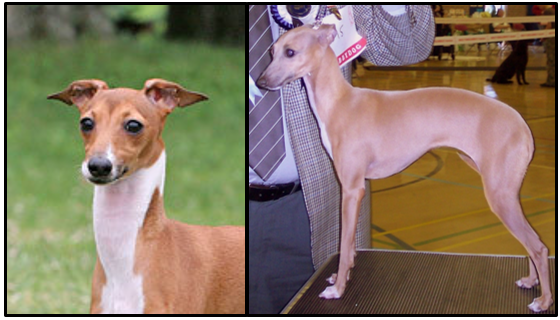 It has lovely, lop ears, an alert stance, and a solid physique – a well built little hunting dog. Country of Origin: Cuba, named after the capital city; Havana – this is the only native breed to Cuba, and is the Cuban national dog. Original Use: Bred for companionship for the children of Cuban nobility and courtiers. When Cuba was under communist rule in the early 1960’s, many owners and breeders fled to America, taking their dogs with them – spreading the breed to other countries. Outstanding Physical Trait: The Havanese has a light, fluffy little coat that is wavy-straight giving them a unique look amongst others in their breed type (such as the Bichon Frise and the Maltese). Country of Origin: Spain – the island of Ibiza, and other surrounding Spanish islands. Original Use: Hunting rabbits for food for the people they shared the island with, and it is still used for this purpose on these islands today. When this breed came about is unknown, but the type has been around for a long time – the type of dog being depicted in ancient Egyptian wall paintings alongside Anubis. Outstanding Physical Trait: Large ears and long body, depicting the look of the Egyptian jackal god Anubis, much like the Pharaoh Hound (personally, I think the wire-haired – pictured below – looks like the Chilly Down Gang from the film Labyrinth). Original Use: Guard and Sight Hound – used for hunting; by royalty mainly, not a dog for common people to have. This breed was often sent as gifts from royalty of one country, to royalty of another country, to keep a positive alliance between them. This breed was used to hunt various large game, as well as any threats such as wolves – used in packs to hunt, guard and protect the local area. Some royals and nobles also used this breed for entertainment value by pitting them in fights against wolves, bears, lions, and other large predatory animals – Julius Caesar is said to have been gifted some for this use in Rome. 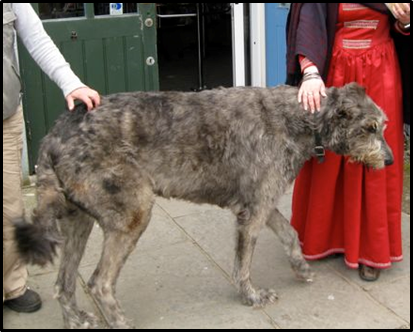 This breed is very old, and has even been mentioned in Irish law and literature (known then as the Cú) as early as the 5th Century!! Outstanding Physical Trait: The fact it is a MASSIVE dog?! Brilliant and tall, with quite a striking face with its’ wiry fur. Original Use: Bred by the Romans as a lap dog for the noble and wealthy, originally. Although, mummified remains of tiny, greyhound-like dogs have been found in the tombs of Egypt, and across the Mediterranean; whether or not these were what we known in today as the Italian greyhound is a different matter! When this breed came about is unknown, but the type has been around for a long time! Outstanding Physical Trait: The size has got to be the most outstanding thing, physically, about this breed – or lack of it!